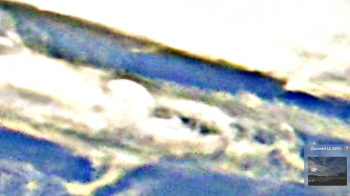 From 4:18 zoomed Orb – the white half moon shape poking up? – seems to be a corresponding – shadow just above? This article is a follow-up. So here it is on January 12 of the year 2015, -40, our car won’t start – thank God for school buses. Minus 40 is minus 40 in both Celsius and Fahrenheit; why don’t they make it the same – imperial vs. metric – our food comes in pounds and kilograms – it is confusing to price check and with package size not decreasing along with the contents… I could go on about that. This morning I was picking thru images of their sky – it is not ours anymore. The moon is still up high – at about 4pm on a summers day – bright and halved – have you noticed anything strange about the moon lately? Ha! I typ-oed and accidently spelt moon’s’. 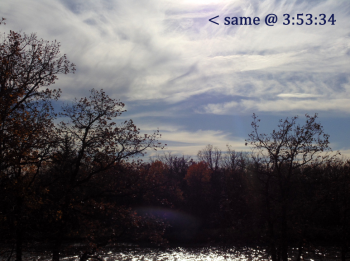 I spend a lot of time silently watching the sky to see …. what? 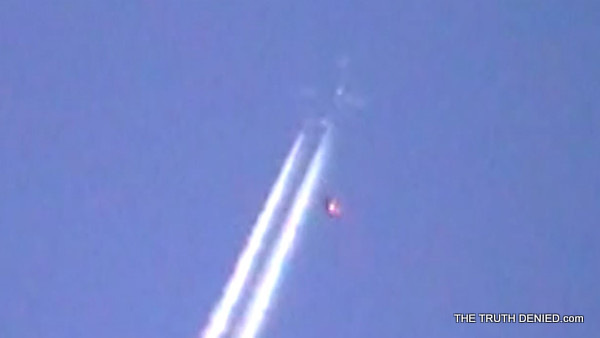 I understand in a layman’s way about chemical spray, geo-engineering, SRM, possible Blue beams. 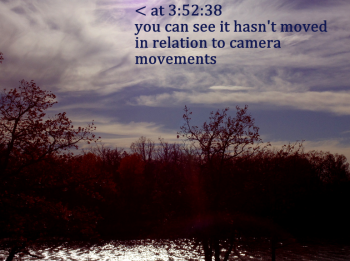 You have to admit, aside from an incredible increase in our cameras visual field with orbs – there are beams and more beams all the time. So why do I still watch, it is like seeing a slaughter house and being so horrified that one is compelled to return day after day – at least it feels that way to me. I have deleted over 20,000 sky images since looking up. What do I have to show for my efforts except full memory and a sore neck! But fear licks at me and I cannot stop and somehow don’t want to – although at times I think we provide them with a lot of – proof for their pudding mix. They don’t need monitoring planes to photograph their handiwork – we provide it. Then they shove it in everyone’s face on TV, magazines – those too big packages and every where else. The way our brains work – it is a perfect way to camouflage their war on us! We are under siege – as truly as those behind the castle walls. This morning while trying to go thru images – I started making a few albums. 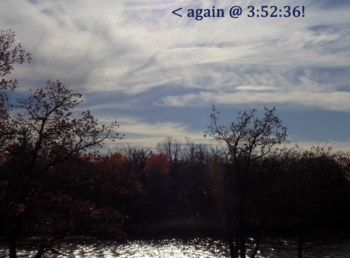 I get to the ones I took on October 15, 2014 at 3:52 PM – looking SW. 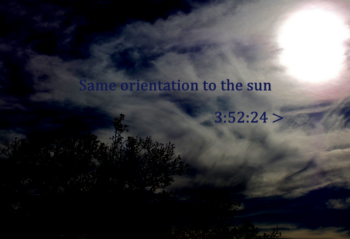 I know that when you see an orb – as you look thru the viewfinder – or if your using a digital cameras and it is very ‘radiant’ outside – you always need to take more than one in a row, with slight movement to ensure the orb you will see when downloaded – will be followed by a second – that moved with you … or didn’t. A good test to determine if it is stationary, therefore something or a reflection/refraction orb. Use of a lens hood also helps reduce reflective orbs – the images we are looking at were taken with a digital Sony – no lens hood. 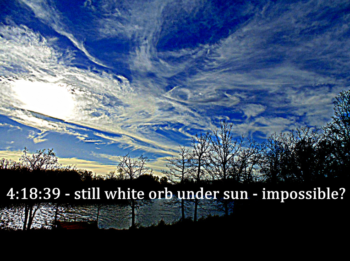 Back to the orb from October – I noticed on the first image a white orb at about the 6:30 position to the sun, lots of fallout clouds streaking the sky, which is what I was imaging. But as is my practice I took a breath and snapped again- you can see the change in the foreground object to confirm I moved slightly. 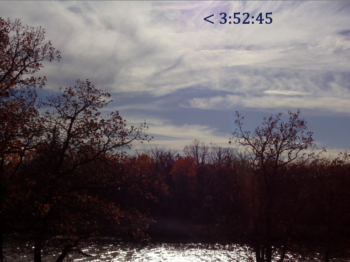 3:52:24 to 3:52:45 – 7 images. The orb remained – here is a set of images – more than 7 because I have enhanced the orb to try to show it clearer. 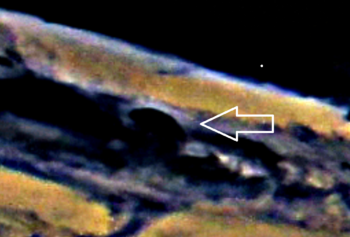 The last time I took a journey – I ended up in Nibiru and returned – this time? You be the judge. could it be a small round cloud? 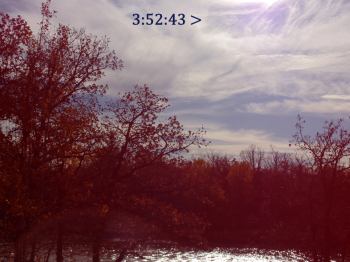 Same place – 6:30 on the sun! 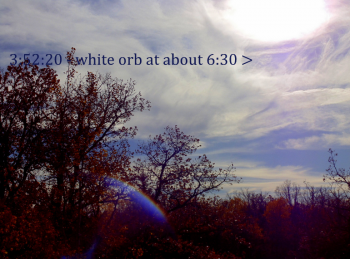 Different perspective – orb has not moved! This is a half hour later – I am taking pictures of the – triangular shapes in the West – but there is still a white orb – under the sun – at the 6:30 position! 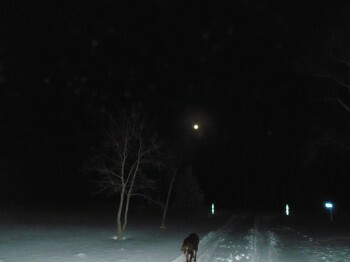 I am outside looking toward the almost full moon – trying to get a picture as I am horribly inept at taking night photos! 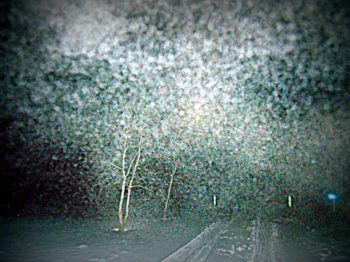 I have seen a lot of images of night orbs and thought them easily explained by dust or ice crystals reflected in the flash and on many nights gone and taken pictures in the dark – trying to prove it is ‘dust’. 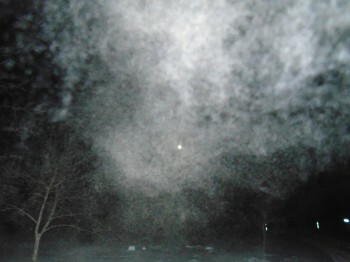 These are from January 4th, 8:32 Pm, -27C with no wind or humidity, the air was dry; no moisture, no ice, no dust. I was very surprised when I saw them in the flash – yet saw nothing the next one – again you be the judge. I can’t explain what is or is not happening. I prefer a logical explanation for things, but lately – there are many things for which I can find no logic. 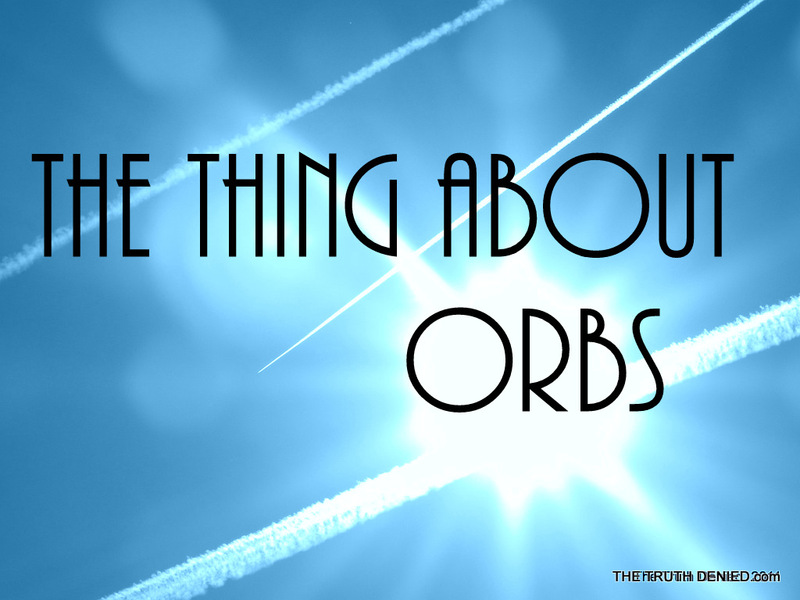 I ‘feel’ when the sky is busy, I ‘know’ when to go outside and when I saw these night orbs – I ‘felt’ something; that is was not …. nothing. 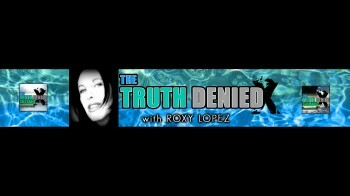 Please join us on Facebook, we have several groups and pages for like minds like you!